MANCHESTER — While still an undergraduate college student at a liberal arts school in Virginia, Joseph Hodge didn’t apply to the graduate schools that would prepare him for a life of law or medicine, much to his parents’ dismay at the time. Instead, he applied to schools around the country that would allow him to focus on music. Hodge graduated with his master’s degree from the Hartt School in May 2012. One short year later, at 26 years old, he is the newly-appointed orchestra music director of the Manchester Symphony Orchestra & Chorale. He admits that 26 is a pretty young age to be in his position. “This is very new, but I’m very excited,” he says. Hodge will conduct three upcoming concerts, one of which is the Manchester Symphony Orchestra & Chorale’s “A Night at the Theater” on Saturday, June 8. It will be his official debut as music director. His parent’s earlier wishes for his future career hardly raise eyebrows; everyone knows what doctors and lawyers do. But what does a conductor do, exactly? As far as many people are concerned, Hodge says, a conductor stands in front of an orchestra and dramatically waves a small white stick at musicians who don’t seem to be paying much attention. There’s a reason for that seeming lack of attention, however: they’ve already rehearsed the number, watched for the nuances delivered via baton, several times. What they’ve practiced is more than the notes as displayed on sheet music; it’s the notes as interpreted by conductors like Hodge. Conductors don’t play an instrument, unless you consider the orchestra the conductor’s instrument. His job, Hodge explains, is to evoke a unified sound from all of the orchestra’s members, to bring together each of their lines of music. Depending on the size of the orchestra, he could be in charge of 60 to 90 people. Add a choir, and the number rises to 100 or more. Hodge is also responsible for choosing the repertoire for all of his concerts, an aspect of the business he calls “admin duties.” He works with a committee, but the decision is ultimately up to him. “Basically, the program that you see in your booklet is something that I took a lot of time to piece together,” he says. Not surprisingly, Hodge has very little free time, but when he does he likes to fill it with running. A runner since high school, he’s training for the Hartford marathon and hopes to qualify for the Boston marathon so he can run in support of those affected by the April bombings. He calls running therapeutic, simple, and calming. An opportunity to take a break from thinking. From music. Hodge wasn’t necessarily prepared to be afflicted with this passion. 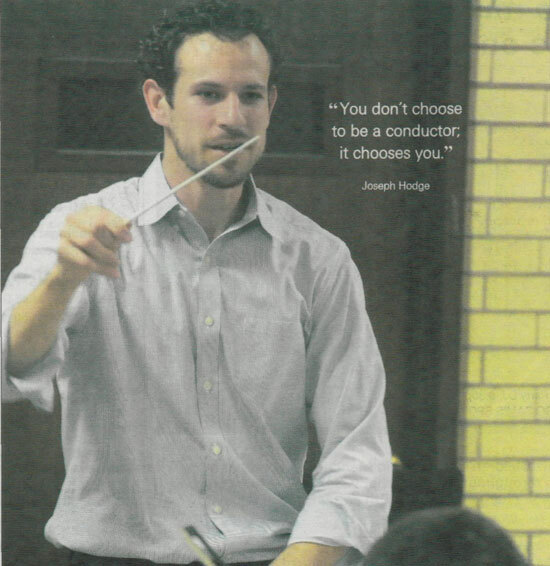 As he explains it (while giving credit to one of his teachers for the line), “You don’t choose to be a conductor; it chooses you.” There was certainly music in his life when he was younger, but it was nothing that would determine his future. His father sang in a church choir, his mother played piano at an amateur level, his sister played flute in school, and he picked up the oboe after hearing it played in church. Professionally, his mother worked in a shop. She wanted Hodge to be a doctor. His father, a worker for the state, wanted him to _ be a lawyer. Although he continued to play the oboe throughout high school with the band, he had no idea what he wanted to do when he “grew up,” so he attended the University of Virginia believing it would allow him to explore his options. Meanwhile, he was also taking music classes for fun, and at the end of his sophomore year he noticed a course offering that intrigued him: conducting. He knew little about conducting other than what he’d seen the band leader do in a drum marching band, and the only classical music he knew was what he’d played on the oboe or what he’d heard his mother play on the piano. Curious, he took the class. The teacher transformed his life. Fortunately for his parents, who might otherwise continue to be concerned about a son who has decided to make music his life, conducting is one of the more stable career options in the field. And now that his parents have seen what he does and have been to his conceits, they’re completely supportive and “totally get it,” he says. Even if comfortably nestled in a professional haven, Hodge is still cognizant of his relative youth and uses it to help shape his programs. The orchestra, after opening “A Night at the Theater” with the Nabucco Overture to celebrate Giuseppe Verdi’s 200th birthday, will perform selections from “Grease” and “The Sound of Music.” “The Sound of Music” pieces will appeal to the typical audience, which tends to be a little older, he says, but “Grease” is part of his personal stamp. “A Night at the Theater,” also featuring full chorus performances directed by Kevin Mack and singers from the Pratt and Whitney United Chorus, begins at 7:30 p.m. in the SBM auditorium at Manchester Community College. Admission is $18 for adults, $15 for seniors and students 18 and older, and free for children under 18. Tickets are available at the door or may be purchased in advance by calling 860-646-0047.